OPINION – It was a cold, damp fall morning, the kind of day when the chill runs straight through your body and into your bones. I was supposed to meet some wildlife folks at the Cedar City airport who were taking a helicopter up the mountain to trap and tag elk. The skies were gray and foreboding and, from the airport, they were low enough to cover the face of the mountain. No way was I going up in a chopper on that day. I can still hear the pilot chuckling as we stood on the tarmac, looking at the clouds. “That’s OK, Ed, I’ll take you up with me,” said a voice from behind me. I turned around and smiled at the voice I recognized from a number of telephone interviews I had done over the years. 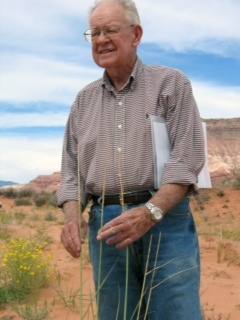 It was Jim Bowns, who taught science at Southern Utah University. We had first met when I was doing a story about the wildflowers blooming in Iron County. I had been out and about and seen some popping up in the desert and up on that grand piece of land where I would go so often to soothe my soul – Cedar Mountain. I wanted others to share the beauty that was about to emerge, the splendid colors, the delicate little flowers and hearty, deep-rooted plants that were about to blanket patches of earth with vibrant color. I asked my usual list of experts who could best tell me about it all and every single one of them mentioned Jim. I got him on the telephone and immediately apologized for my ignorance, but also told him how beautiful I thought it all was and that I wanted to share it with my readers. Instead of just telling me about some little back roads and byways where I could send people, he told me what they would see, and when the best time would be to see them in bloom. He quickly detected my love of nature and all it has to offer and we talked … and talked … and talked. I think, seriously, we chatted for about three hours. I would rely on him when I wanted straight answers to my questions about the rangeland, the local mountains, flowers, animals, or anything else to do with the outdoors. We lost Jim, one of the world’s true gentlemen, over the weekend. I don’t know how many students he influenced during his years at SUU, but I do know that every one of his students I ever talked to held him in the highest esteem. He taught with passion, he cared about his students, and he had a knowledge base that was deep and broad. There aren’t many like him these days. It got to the point where I learned so much from him, I could pass on those random bits of knowledge as I drove through an area we had talked about. In fact, this summer, when my wife and daughter and I camped on the mountain for a few days, I found myself pointing at things and telling them the interesting little nuggets of information I learned from Jim years ago. One of my best days in Cedar City was that gray, ugly day when we were supposed to watch them trap and tag elk. Jim graciously offered to let me ride shotgun as we drove to the site, which is really a good thing because I would have never found the little clearing on my own. It had rained and the mountain had that fresh, damp smell. He understood why I rolled down the window on his old truck as we drove and breathed the fresh air. We took a turn up Right Hand Canyon, following the twists and turns. We paused at the overlook to the valley, which seemed to stretch out forever. All the while, I had a unique, one-on-one learning experience. We reached our destination atop the mountain and waited. After about an hour, the chopper landed in the very small clearing and the pilots walked over to tell us that it was too cloudy, too risky to be skimming the treetops in search of elk to tag and that they would have to do their work another day. I just sort of smiled at Jim, who smiled back. We followed a path – in some places there was actually a road, in others, just a couple of bare lanes in the mountain field – to a spot where a padlocked gate stopped our progress. He jumped out of the truck, found a key and unlocked the gate. I hopped out after we went through and locked it behind us. We rode on a little way through some beautiful scenery until he came to a stop. “It’s only a short walk from here,” he said. It was quiet, the kind of quiet that you hear when you have been on the mountain for awhile; so quiet you could hear the squirrels scamper up the trees, the crunch of leaves as a deer passed nearby, the kind of quiet that makes a single raindrop falling on a leaf sound like a rude interruption. We walked the short distance to one of the most breathtaking overlooks I have ever seen. The colors, the formations, the serenity of standing on a mountain was breathtaking. The only thing to ever top it was when my wife and I would watch the whales dance in the Sea of Cortes in Mexico, offering Nature’s most beautiful ballet. We stood there, mostly in silence, for about a half an hour, taking it all in. I knew he had been there many times before, but could see how his familiarity did not lessen his awe of the pastiche laid below us. As we wound down the mountain, he would pull over every now and then and explain exactly what it was that I was seeing – from the sparse native plants to a streak of coal running horizontally way up one sheer wall of rock that was mined, he told me, to fire the iron foundry in town. All too soon, it was over and I was shaking his hand, thanking him for the half of a day spent away from the real world and its problems, ringing telephones, and deadlines. And, all too soon, Jim has left us. But, in a way, he hasn’t, because, you see, his influence has touched many lives – students, friends, family – and we remember him with fondness as a teacher, friend, and gentleman. Wonderful tribute to a great man who loved this land. Thanks Ed.